Substituting for someone this season? Register for the appropriate sport by clicking the respective link below. Before your game, check-in with the game coordinator to sign the waiver and pay the $10 sub fee. Please wear a shirt that is the same/similar color of your teammates'. More information about the substitute policy and procedures can be found below. BASKETBALL - Register as a Substitute Player! SOCCER - Register as a Substitute Player! FLAG FOOTBALL - Register as a Substitute Player! 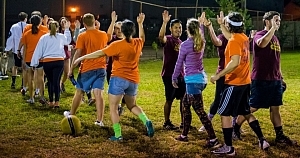 KICKBALL - Register as a Substitute Player! SOFTBALL - Register as a Substitute Player! VOLLEYBALL - Register as a Substitute Player! How does the substitute policy work? If your team is short, you may pick up a player from another team for the game as long as the opponent’s captain approves. ---Before the start of the game, the captain will make the game’s head ref/game coordinator aware of their non-rostered substitute. At that time, the substitute will provide his/her full name, e-mail address, and phone number. The substitute will pay a game fee of $10 in cash and sign the league waiver. ---The head ref/game coordinator will record the substitute’s full name, e-mail address, and phone number on the League Substitute Form. He/She will place the game fee in the provided envelope and make sure the substitute signs the waiver. --Substitutes should wear a shirt that is the same/similar color as their teammates'. A substitute may only pay the $10 league fee twice. If a substitute wishes to play more than twice during that season, he/she must pay the remaining league fee and will be considered a rostered player from that point onwards. For example, if the league fee is $70 and the substitute has paid two $10 sub fees, the substitute needs only to pay the remaining $50. This can be done in cash at the field, or in the office by credit, check, or cash BEFORE the next game they plan to play. If a substitute is not declared before the game and/or does not pay the game fee by halftime, the substitute will be ejected and the team’s points up until that time will be erased and the game will continue, or the game will end and be recorded as a forfeit. Substitutes cannot be used in the playoffs. However, if the opposing team consents, substitutes can be used and the process of signing the waiver and paying the fee will take place before the game. Substitutes, once paying the full league fee, may receive a team t-shirt if in stock. Special orders will not be made mid-season.